Just a week after Google’s Q1 2017 earnings report, Facebook announced a revenue of $8.03B, beating analysts’ estimates for the eighth quarter in a row. The world’s largest social network and the largest ad seller after Google shows no signs of slowing down the growth. 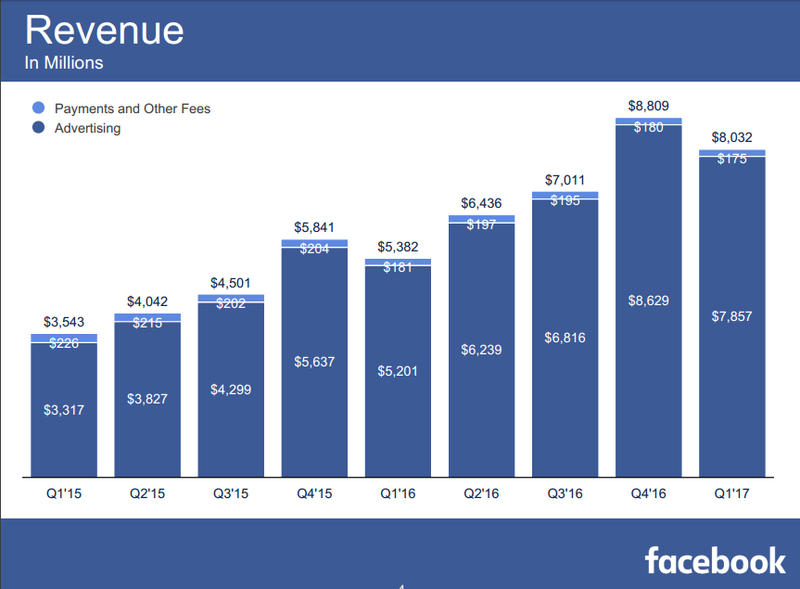 With $8.03 billion, Facebook reported 49% YoY increase in revenue. Mobile ad revenue represented about 85% of total ad sales, while its desktop ad revenue continues to hold steady with $1.2B in the first quarter. Facebook no longer breaks down its Monthly Active Users to report on mobile and mobile-only audience numbers – a sign that it no longer needs to prove itself as a mobile-first company. Instead, “video-first” strategy comes into the spotlight as the tech giant continues to promote its live video and 360 video tools. No surprise there, as a particular highlight last year was the growth of mobile video. According to AIB Internet Advertising Revenue Report, mobile video ad revenues skyrocketed in 2016, more than doubling – up 145% YoY in the U.S. In a battle for younger social app audiences, Facebook continues to experiment with a versatile camera, filters, “Stories” and other features across its apps to win over more mobile screen time from Snapchat. User growth in the latest quarter was pretty strong, with MAU increase of 17% YoY and now accounting for almost 2B people. 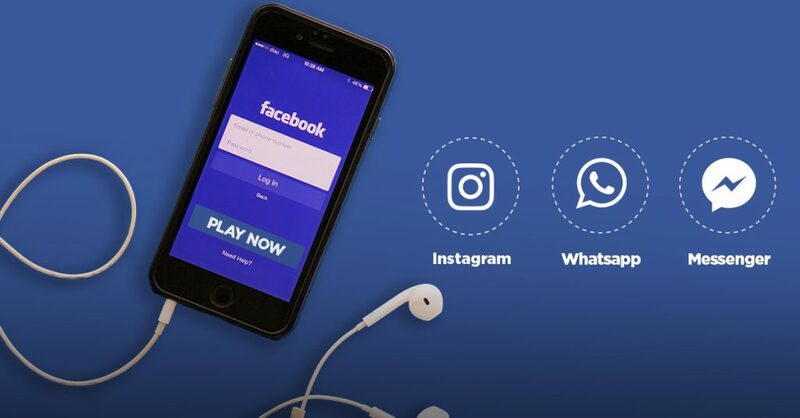 Instagram has more than 700M monthly active users while messaging apps WhatsApp and Messenger have more than 1.2B MAU. Both Instagram and video ads seem to be the two key growth drivers that move Facebook away from its “growth slowdown” warning (due to the limit of the ad load in the News Feed). And although the report doesn’t break down how much money the company makes from Instagram, eMarketer predicts the app’s ad revenue to grow 106% this year, reaching $3.9B. With a still-ballooning user base, the company has been able to serve more ads in total. Given the increase in ad supply, the advertiser demand grew accordingly, thus driving ad prices higher. At the same time, average Facebook ad revenue per user saw a year-over-year increase of 22.5%. Worldwide AARPU in the latest quarter was $4.14 with US & Canada at the top of the chart with $16.56. With a steady growth of its user base, Facebook continues to be the leader that redefines the digital landscape and provides unprecedented access for advertisers to reach consumers. The announced 1,700 new employees who joined Facebook during the first quarter (a company record) speak to the continued evolution of new formats and ad products that will lead to increased user engagement and will enable marketers to find the right audience. yellowHEAD’s user acquisition experts work closely with Facebook to maximize our clients’ ad spend. Through robust expertise, constant innovation, and fast adoption of new features, we are able to massively scale our activity and quickly achieve strong results. If you want yellowHEAD to help you maximize your ROI on Facebook, contact us today!